Much admired Canberra citizen Honor Thwaites left her community with an important legacy. Her vision for the Remembrance Nature Park in Campbell led to the creation of an urban refuge, an oasis of natural beauty. Located behind the Australian War Memorial, at the foot of Mount Ainslie, the park is a lovely setting for the purpose of reflection. The story of how this passionate Canberra citizen became the driving force behind positive community action, and the impetus for Government policy change, shows how this lasting memorial was created within our city. The file '78/3095: Lands Division - Statutory Processes - Remembrance Nature Park' documenting the origins of the park is ArchivesACT's find of the month. Walter Burley Griffin's 1925 'Statutory Plan for Canberra' outlined a road running along the base of Mount Majura and Mount Ainslie, linking Canberra's northern suburbs with the City. In May 1956, the Commonwealth Government gazetted this road as 'Monash Drive'. By the 1960s, while still unconstructed, maps showed Monash Drive extending from the end of Stirling Avenue in Hackett, to the east of Ainslie and Campbell, terminating at Morshead Drive near Russell. Despite being planned for so long, the proposed road finally became a contentious issue with residents during the mid 1970s. 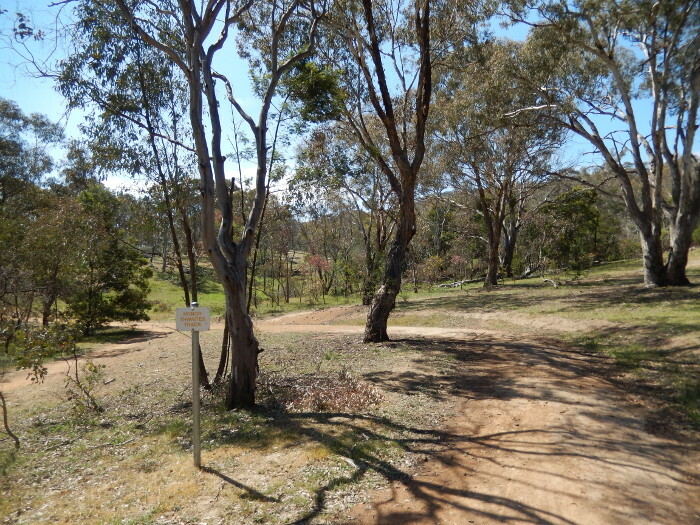 Its construction, flagged to begin in the early 1980s, would remove the easy access people enjoyed to Mount Majura and Mount Ainslie. 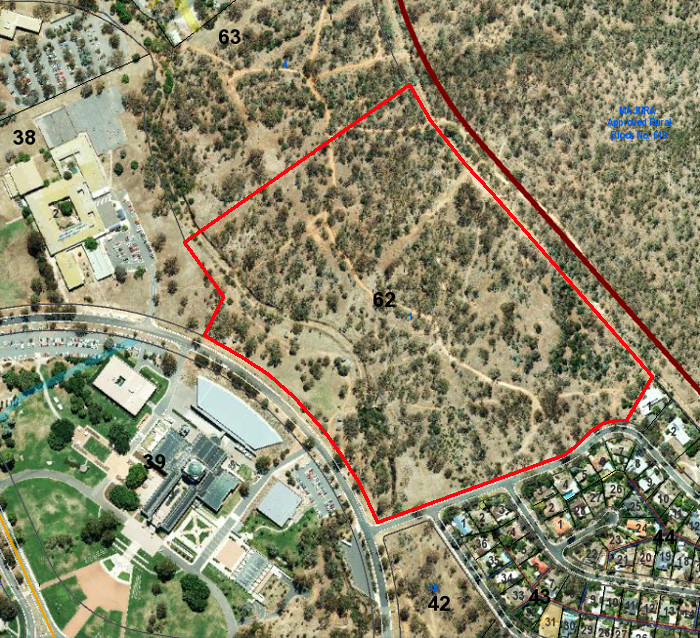 There was also a wider concern about the visual impact a proposed housing development would have to the 680m line along the base of Mount Ainslie. In December 1976, the National Capital Development Commission (NCDC) released its proposal for this area as part of an overall urban infill plan taking in the suburbs of Ainslie, Hackett, O'Connor, Yarralumla, Campbell and Deakin and comprising over 2000 houses. In the National Capital Plan, the NCDC had zoned the vacant land between Monash Drive and the suburbs of Hackett, Ainslie and Campbell for over 1000 of these homes. This resulted in the formation of a residents' action group called The Mount Ainslie-Majura Protection Association who protested the development on the grounds of environmental and heritage concerns as well as the contradictions between the infill proposals and the Griffin Plan. In February 1977, Campbell resident Mrs Honor Thwaites decided to act on an idea she had been considering for a number of years. Honor Thwaites was born as Honor Mary Scott Good in 1914 to Dr and Mrs R.N. Scott Good, at Young, NSW. After completing an honours degree in French and German at Melbourne University, Honor Scott Good travelled to Britain in 1938 where, in 1940, she married Mr Michael Rayner Thwaites, who was serving with the Royal Navy. After World War 2, they returned to Australia, firstly to Melbourne then moving to Canberra in the early 1950s. The Australian Security and Intelligence Organisation (ASIO) recruited Michael in 1950 where he played a major role in the Petrov Affair. In 1971, Michael left ASIO to work as the Assistant Parliamentary Librarian. It was around this time that Honor Thwaites first conceived the idea of a "Peace and Freedom Nature Park" on the vacant land opposite her Cobby Street home. One of the areas designated for urban development was Campbell Section 62, an area of land that sits immediately behind the Australian War Memorial. The NCDC identified the blocks along the section's eastern edge fronting Cobby Street as "being suitable for medium density residential development." On the 14 February 1977, Honor Thwaites first met with Mr Neil Sligar, from the community relations section of the NCDC, regarding her proposal for a park. The NCDC had not yet made a final decision on the medium density housing proposal, and acknowledged resistance to this development, saying that "undertakings were given to Campbell residents that a range of alternative land uses would be investigated before any final decision was taken." Aerial view of Campbell Section 62 outlined in red. "This 'Peace and Freedom Nature Park' would link it with the War Memorial, as a symbol of the peace and freedom two generations of Australians risked and gave their lives to defend. The War Memorial then, as well as enshrining the past would stand as a gateway to the future." "In the area is a rocky cleft which offers a natural open air theatre for the performance of Aboriginal music and dancing, or bush ballads etc. In an authentic setting, with, at the same time, a glimpse of Parliament House through the trees!" "The Executive found itself very strongly in support of the concept, and also of the idea that this would be an admirable means by which the 60th anniversary of 'Remembrance Day' on the 11 November 1978 might be suitably commemorated." "I have been over the land in question, and I must agree with the views that have been expressed by the local residents that medium density residential development in the area to the west of Cobby Street, would detract very greatly from the development of the rest of the area as a park land suitable for nature walks and the development of other outdoor facilities." "Get out a final reply along the lines of "thank you for your proposal - the matter has been taken up with the National Memorials and/or NCDC (as appropriate). Then, as possible, investigate the question of whether R.S.L. is behind proposal, to what extent etc. etc." "The suggested park would be related to a most important national memorial and affect an area of national significance. Accordingly, it would not only be a matter of interest to people and organisations in the wider community, but would require consideration by a number of official bodies." Toward the end of June 1978, Keys followed up with Ellicott for a progress report on the park proposed as a means of commemorating the 60th Anniversary of Remembrance Day. He raised the concern that "time is passing rapidly, and if anything is to be done prior to this date, an early start would be essential." By July 1978, Ellicott approved of the park's concept. But now there were some reservations about the name Honor Thwaites had originally put forward. One file note considered the name of Peace and Freedom Nature Park as "rather an unfortunate choice" although didn't explain why. Elliott also found it "rather long for common usage" and suggested the name Freedom Park as more appropriate. In explaining his concern to Honor, Elliott suggested she would like to consider another name and to "let me have your views." In August 1978, the final hurdle to the park vanished when the NCDC dropped their plans for residential development on Campbell Section 62, classifying the whole area as parkland. "One point that has caused some discussion is the matter of a title for the area. The National Executive of the R.S.L. discussed this, and we tend to agree that if it is called the "Peace & Freedom Nature Park" this becomes a little long winded and would tend to be abbreviated in any case. We feel therefore, that the most appropriate name would be "Remembrance Nature Park." "On returning home I was delighted to find your letter of 20.9.78, giving the news of your decision to declare the Nature Park behind the Australian War Memorial, as a means of commemorating the sixtieth anniversary of the 11th November, 1918. Mr Keys has told me that the R.S.L. would like to have the word "Remembrance" incorporated in the name, so "Remembrance Nature Park" seems to express what is needed." 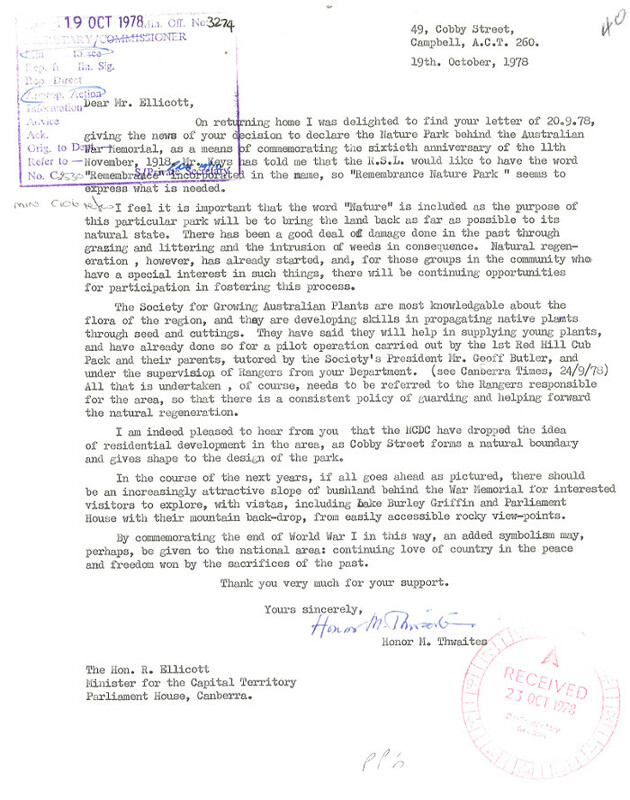 Letter from Honor Thwaites to Minister for the Capital Territory, Bob Ellicott, dated 19th October 1978. 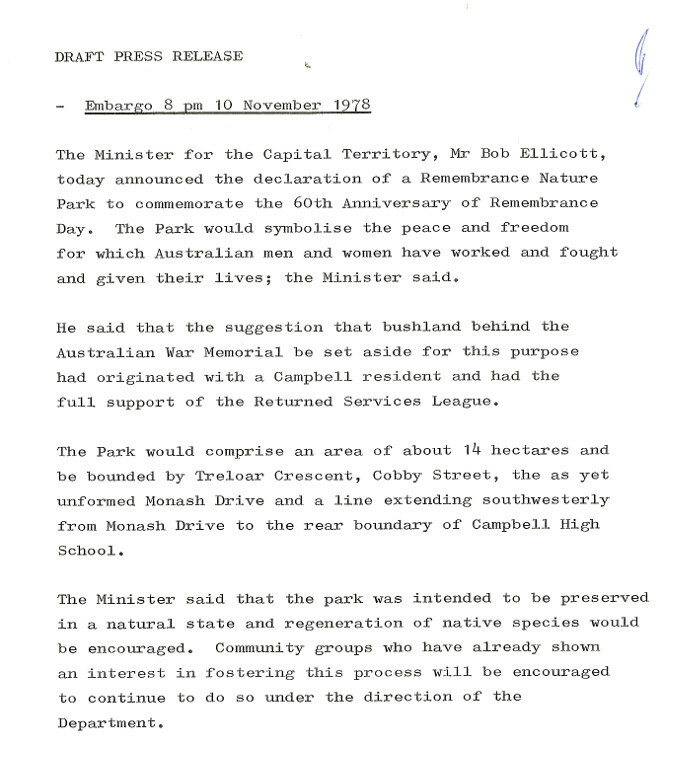 "Declaration of Certain Land to be a Public Park"
In just under two years, Honor's vision came to pass when the Commonwealth Government officially declared Campbell Section 62 the 'Remembrance Nature Park' on the 11th of November 1978. Monash Drive was never built, and the National Capital Authority (NCA) ultimately removed it from the Territory Plan in 2009 . "Remembering the Aboriginal People who Served"
The restoration of the Remembrance Nature Park was to be an on-going effort. Honor and Michael Thwaites formed a volunteer group called Friends of The Remembrance Nature Park. With the Friends' assistance and additional help from students from nearby Campbell High School, over time litter on the site was cleared, walking trails constructed and re-vegetation with native plants took place. In February 1987, the Friends held a meeting to discuss the erection of a memorial to Aboriginal Australians who served in the Australian armed forces. The Australian War Memorial had no dedicated memorial for indigenous service personnel and the Friends wished to fill this gap. They planned the unveiling of the memorial to coincide with Australia's Bicentenary and the 70th Remembrance Day in 1988. "Remembering the Aboriginal people who served in the Armed Forces"
Michael Thwaites, commenting on the memorial in January 1999 said, "we felt that Australia's debt to the Aboriginal people who served in the Australian forces was inadequately commemorated." Michael and Honor felt it fitting "to place a plaque in a setting which the Aboriginal people have known and loved for thousands of years." The Memorial to Aboriginal Service Personnel. "We spent last Remembrance Day together with our son and daughter. We got Honor into our old car, grabbed the key to the park, and drove her to a bench where she sat and looked out over the hills. It was the last time she got to the park."